The strips are intended for testing urine in the home for Nitrite, Protein, Urobilinogen, Blood, Specific Gravity and Bilirubin. Urine testing is a useful procedure as an indicator of health or disease as the composition of urine can change markedly when a wide variety of diseases or infections are present. Because urine testing is simple to carry out, it can be part of routine health screening in the home. The Family Health Screening Test can be used to give a general indication of health and helps in the detection of diseases and infections that can affect the kidneys, urinary tract, liver and heart. 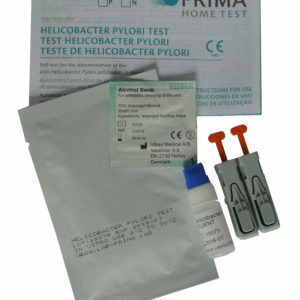 The pack contains six strips so that routine testing can be carried out at regular intervals. Nitrite: Nitrite is not detectable in normal urine. Positive nitrite can be indicative of urinary tract infection. Protein: Up to 14 mg/dL of protein may be excreted by a normal kidney. Higher than normal levels of protein in urine may indicate a variety of disorders including diseases of the kidney and urinary tract. In older patients, high protein levels may occasionally indicate heart problems. Urobilinogen: Urobilinogen is normally present in low concentrations in urine. High levels of urobilinogen can indicate liver disease or conditions associated with increased breakdown of red blood cells. Blood: The presence of red blood cells or haemoglobin in urine can indicate diseases or damage to the kidneys or urinary tract. Specific Gravity: Urine collected at different times of day may vary in specific gravity from 1.003-1.035. Specific gravity equal or less than 1.010 indicates dilute urine and readings equal or greater than 1.025 indicate concentrated urine. Low readings may simply be due to excessive liquid intake and high readings may be due to insufficient drinking causing dehydration. However, persistent low readings can be due to kidney problems and continuous high readings can be indicative of underlying clinical problems relating to the kidney and possibly the heart. Bilirubin: Bilirubin is not found in normal urine. The presence of bilirubin in urine is an early indicator of liver disease such as obstruction of the bile duct or hepatitis. The table below indicates read times and performance characteristics for each parameter. Detects sodium nitrite as low as 0.05-0.1 mg/dL in urine with a low specific gravity and less than 30 mg/dL ascorbic acid. Detects albumin as low as 7.5-15 mg/dL (0.075-0.15 g/L). Detects urobilinogen as low as 0.2-1.0 mg/dL (3.5-17 µmol/L). 5-10 erythrocytes/µL in urine specimens with ascorbic acid content of <50 mg/dL. Determines urine specific gravity between 1.000 and 1.030. Results correlate with values obtained by refractive index method within ±0.005. The performance characteristics of the Family Health Screening Test have been established by both laboratory and clinical tests. Generally, these tests are specific for the individual parameters being measured. However the results can be affected by various substances which interfere with the test reaction. Please refer to the Limitations section in this package insert for further details. 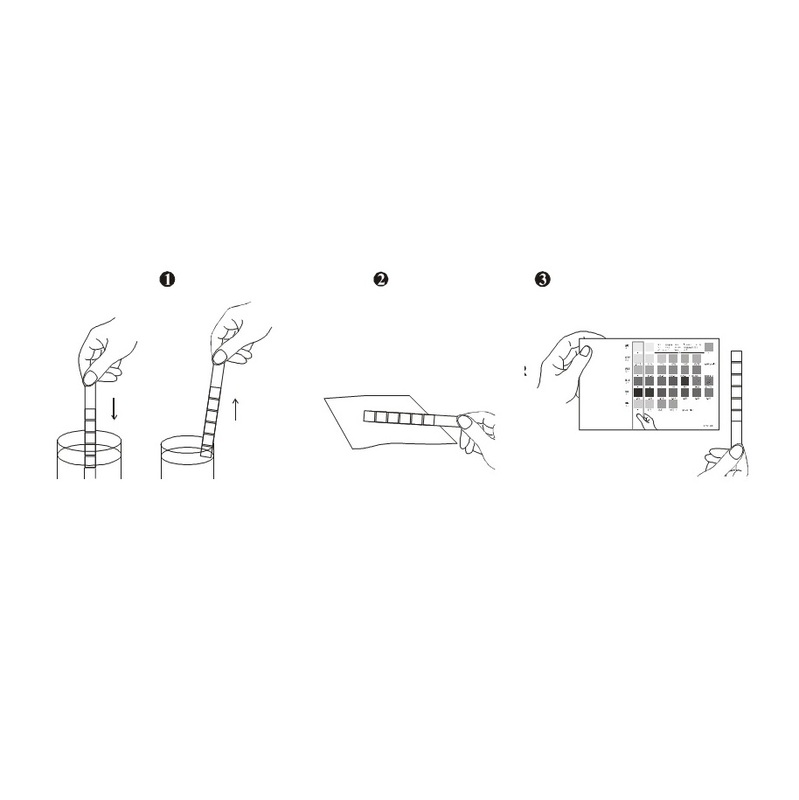 Interpretation of visual results is dependent on several factors: the variability of colour perception, the presence of any interfering substances, and the lighting conditions when the strip is read. Each colour block on the chart corresponds to a range of concentrations of the test substance. For more detailed information on general health conditions please click here. For full instructions on how to use this product click here. A urine sample must be collected in a clean and dry container and tested as soon as possible. If testing cannot be done within an hour, refrigerate the specimen immediately and let it return to room temperature before testing. Do not store urine at room temperature for longer than one hour as test results may be unreliable. Do not contaminate the urine sample with skin cleansers containing chlorhexidine as this may affect test results. Remove the strip from the sealed pouch, and use it as soon as possible. Hold the end of the strip farthest away from the test pads. Dip the test pads of the strip completely into fresh urine for 1-2 seconds and remove immediately. Run the edge of the strip against the rim of the urine container to remove excess urine (see illustration 1). After removing the strip from your urine, immediately bring the edge of the strip into contact with an absorbent material (e.g. paper towel). Lay the strip with the test pad(s) facing upwards and begin timing (see illustration 2). Read results. After the specified times shown on the colour chart, compare the colour of the test pads with the colour blocks on the colour chart. Hold the strip close to the colour blocks and match carefully (see illustration 3). Note: Results may be read up to 2 minutes after the specified times. Results are obtained and interpreted by comparing the colour of the test pads on the strip with the colour blocks printed on the colour chart. 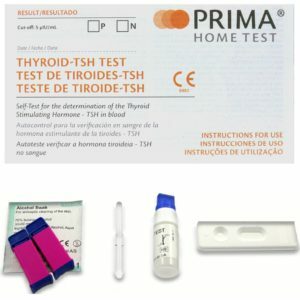 In the event of unexpected or questionable results, confirm that the strips have been used before the expiry date printed on the pack then repeat the test using a new strip. If the results are outside the normal levels (see below), consult your doctor. Nitrite: Any degree of uniform pink to red colour should be interpreted as a positive result and you should consult your doctor. Viewing the test against a white background may help the detection of low levels of nitrite, which might otherwise be missed. Pink spots or pink edges should not be interpreted as a positive result. Protein: If your result is 30mg/dL (0.3g/L) or more, consult your doctor. Urobilinogen: All results lower than 1 mg/dL urobilinogen should be interpreted as normal. If your result is 2mg/dL (35mmol/L) or more, consult your doctor. 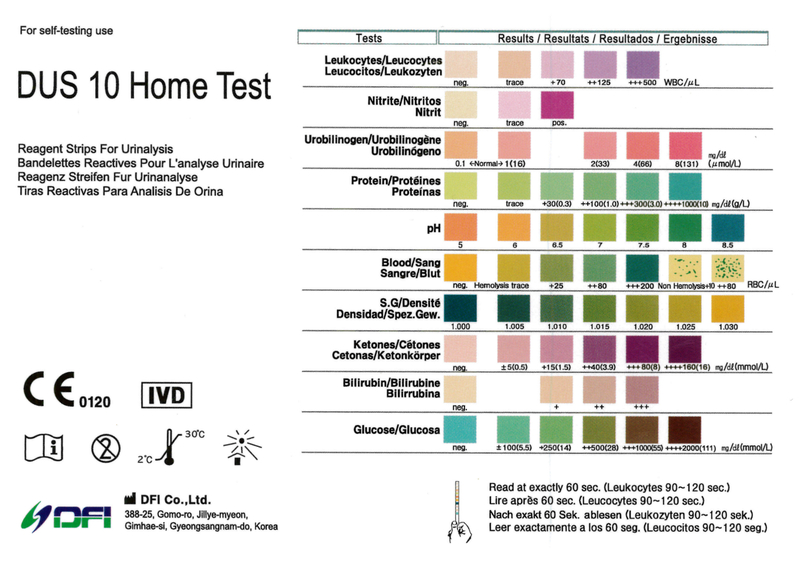 Blood: A positive (+) result may be seen as either a uniform colour change of the test pad or the appearance of green spots on the test pad (see colour chart). If either type of positive result is obtained, consult your doctor. Specific Gravity: A single low reading or a single high reading does not indicate a problem (see Principle and Expected Values). However, persistent low or high readings over a period of time should be checked by your doctor. High protein levels in urine (more than 300mg/dL) can cause high specific gravity results. Bilirubin: Bilirubin is absent in normal urine, so any positive result should be investigated further by your doctor. If you are taking drugs containing chlorpromazine or rifampen, colour reactions may occur on the test pad that might be mistaken for positive bilirubin.